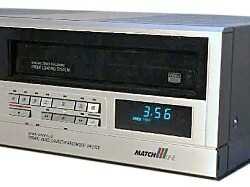 The V2350 was introduced as part of the Philips Match-Line ® series which comprised VCR's, monitors, tuners and hi-fi. For Philips the rugged rectangular shape was a break with the traditional styling and an attempt to bring V2000 into the new range. It was the first Philips machine to have front loading. 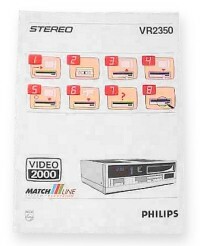 The V2350 was an advanced machine featuring Stereo linear sound, Frame advance, Slow motion playback, Audio dub, simulcast audio record ( allowing an external audio track to be recorded along with pictures from the inbuilt tuner ), a camera socket and two microphone sockets ( left and right ). It also featured Infra Red remote control, a time remaining indicator on the front panel which gave ( fairly ) accurately reports of the amount of time left on any cassette, and a scart socket - which was supposed to make AV input and output connections on V2000 easier. However Scart had yet to catch on in the UK market and so this model was like its predecessors, difficult to interface. One particular quirk of this model was that it would not accept a cassette until the eject button has been pressed first to open the cassette flap! The machine was produced in a light silver grey colour and was retailed in the UK for £ 549 in 1984. Many thanks to Kelvin at AudioViz and Cees Doomernik for help with information and pictures on this model.